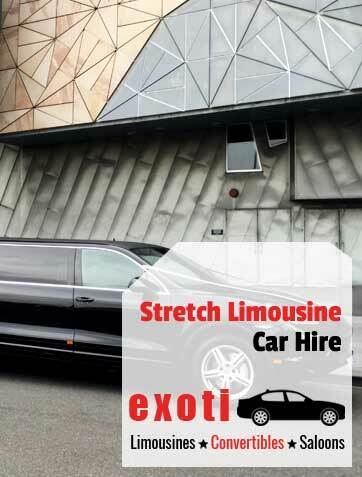 Stretch Limo Hire in Melbourne has never been as exciting as now. We provide our clients with the most cheap and practical options in our Limousines. Be it the Porsche Cayenne Limo in Black, the Range Rover Limo in Sliver or the latest Chrysler 300 Limousines with Jet Doors in Black or White. We cater for Weddings, Birthdays, Anniversaries, Corporate Events, Nights Out, Debutantes, Formals and for anything you require a New Stretched Limousine for. Why choose Exoticar Euro Luxury Hire? Because our experience and knowledge, will ensure your upcoming event goes smooth . And we match you with the right stretch limousine in Melbourne. That is very important indeed! For our High Rollers, try the Porsche Cayenne Limousine in Black with the Classy Chic Interior and 3D Roof Lighting. And our more sophisticated folks, try the Range Rover Limousine, with the classiest Interior of any limo from the cross stitching to the Granite bar – make no mistake, this limo is unlike no other. Then, for our hip folk why not try the Chrysler Limos and mind you, we only have the latest shapes. No old limos here! Our Black Chrysler can be dressed up for the Corporate’s or turn on the Lights and the Disco atmosphere has begun….. With our Latest New Chrysler Limo in White…. Watch-out… People, especially the ladies are fighting over this one. The all white interior, must do something for the ladies….turn on the mood lighting and send them all to another stratosphere! Marriage is the most beautiful day for every bride. On that day, everyone has their eyes on her. Just imagine, when she exits from the Stretch limousine on her wedding day, this moment makes her so special and gives her a touch of royalty. We have helped various couples by giving them the most amazing experience of a stretch limousine. We feel proud by making their day more special. When you are planning for any special occasion and you are looking to hire a stretch limousine, you can take our help. Our team is available 24/7 for you. We assure you that we will give you a luxurious ride. Whether it is nights out, day tour, business meetings or any other occasion. Our limos make your transfers luxurious and relax. We serve you our vehicle in an excellent condition at the affordable prices. We make your trip memorable. Our well mannered chauffeur will be at your place on time and drive you safely at your destination. You can easily book your reservation through our website or call us on the given number. Our priority is to give our passengers a safe and reliable journey. When you are going to a special event and you want to arrive there in style and luxury. We offer you the best stretch limousine to make your event more special. Our vehicles will complete all your desires.